Hello Doodlebugs! It's Mendi here today with a layout using Doodlebug's new Spring Garden collection. When I decided upon these photos I thought it would be fun to line them all up in a row, but I needed a vertical design that would balance the strong horizontal element of my photos. 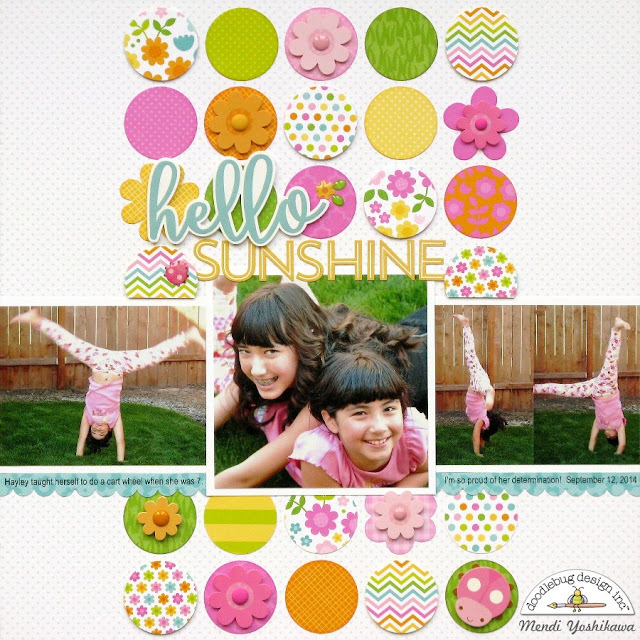 A 1-3/8" circle punch was the perfect tool to create a grid to fill the space I had with all the fun prints and embellishments from this collection! To add some interest and a little bit of texture I popped some of the circles up with a slightly smaller circle die-cut from coaster board. I then popped up the flower stickers with foam tape which is slightly thicker. Using the two different materials gave my page some nice variation. When I was nearly done I realized I hadn't left myself a good place to record a little journaling so I got creative and printed it onto a thin strip of patterned paper, punched the edge with a border punch and added it as a decorative border under my photos. I love how it ties in the aqua color of the "hello" word in my title and solved my little predicament at the same time! Love this layout! Love the colors, so cheery and fun! Tfs! Love the circles, such a fun layout Mendi! I'm going to have to lift this fabulous layout! Great design!